his new luxury log cabin rental, only three miles from downtown Bryson City, North Carolina features over 2800 square feet of spacious living. 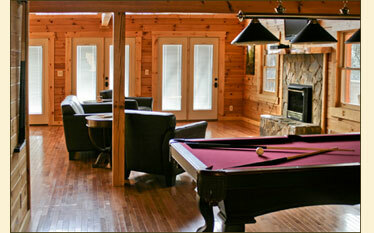 The furnishings are upscale and the amenities are numerous. We have done our best to make this your home away from home. Perfect for a vacation with friends and family. Located on a quiet mountain ridge with beautiful mountain views, Sophie’s Choice is naturally landscaped with a groomed side yard for playing or simply relaxing. Leather furniture, hardwood floors, granite/travertine countertops, and log-wall interior are just some of the ways that we have brought the outdoors in to truly make this your dream mountain get-away. The large great room has a leather sofa, two leather chairs and large leather ottoman that face a gorgeous hand-crafted stone gas fireplace with flat screen TV over head and high definition satellite. It has three sets of French doors that open onto the expansive deck where you’ll find Adirondack chairs and a hot tub for gathering, watching the beautiful sunrise, enjoying the mountain view, or stargazing in the evening. This spacious living/dining area features a slate pool table for your entertainment and a dining table that seats eight with additional bar counter seating for two. Your kitchen is appointed with granite countertops and all new appliances including refrigerator, stove, dishwasher, microwave, coffee maker, and toaster. We also provide you with all of the dishes, utensils and pots & pans that you’ll need. A gas grill is also provided and a spacious mud room houses a washer & dryer for your convenience.